Most organisations are trying to be smarter about the way they engage with their customers. When you add the volume of various communications channels you have available, the complexity becomes significant. But it doesn’t have to be an overwhelming task, as there are some quick wins that will get you to a decent starting point. For marketers today, data is a significant issue and until that data is clean and as accurate as they can get it, automation proves a challenge. So, let’s go back a few steps and look at data. To begin with you need to create a source of truth, a system that your marketing automation platform can talk to in order to drive campaigns. For many organisations, the CRM or Customer Relationship Management system is that source of truth. Most CRM platforms function around what’s referred to as “objects”. These objects are individual databases within the platform, specifically they’re referred to as “relational” databases. This means, for example, the “Contact” within the CRM is related to the “Account” object. It could also be related to the “Lead”, “Opportunity” and other objects within the CRM. It’s the relationship of specific data to other data that a marketing automation platform e.g. Oracle Marketing Cloud Eloqua, talks to and then enables you to segment by. It also enables you to personalise your communications. There’s really no limit to the depth of the integration. If it exists in your CRM, Eloqua can access it. This includes Custom Objects that you may have created in your CRM. For example, you may have a Custom Object in your CRM that captures product and warranty details. This means you could take the segmentation criteria above, switch out “prospect” with “customer” and then add values to include specific products that customers have and determine if those products are in or out off warranty. The idea of personalisation has almost taken on “buzz word” phenomenon. However, for Eloqua users personalisation means a wide range of capability. 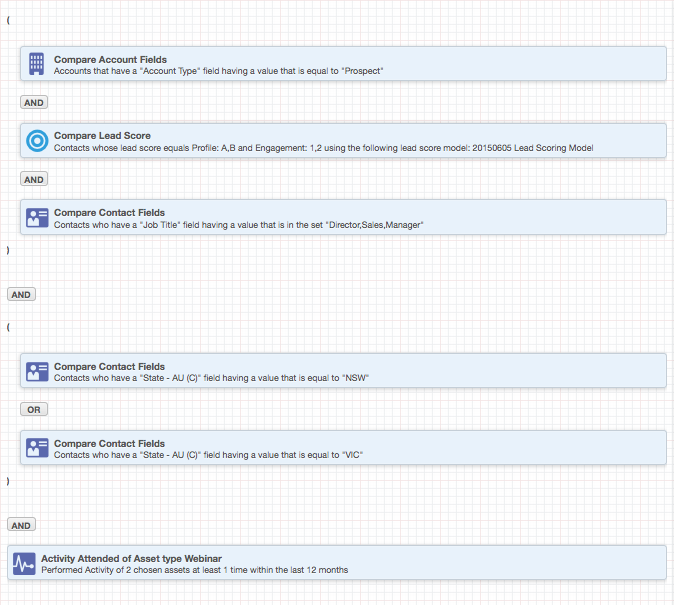 Inclusion/Exclusion of people in campaigns based on the data you have access to within the CRM. You can take specific data contained in a CRM field and “Field Merge” it into your copy. e.g. addressing a person by their first name is the most common use of personalisation/field merge. Use specific data from the CRM to present images or a block of copy to a person based on specific data. Eloqua users have access to a function called Dynamic Content. Dynamic relates to your ability to prepare multiple pieces of content e.g. emails or landing pages and present specific content to a single person or contact based on that data. If you have the data stored in your CRM, Eloqua can access that data. Regardless of the data being stored in a standard object or a custom object, you can access that data and use that data for segmentation of personalisation. When creating a campaign, you may create your segment based on industry criteria. Let’s say you’re focussing on Mining, Construction and Manufacturing. While contacts from these three groups are the perfect target for what you’re offering, the manner in which you pitch the message to these three groups will differ and it could be argued that changes in imagery could also deliver a better experience and possible outcome. Dynamic Content allows you to build a single email and/or landing page and present specific copy and/or images based on an individual contact’s data profile. The other very common request from Marketers is being able to send emails to an audience from specific individuals within your organisation. This means with an audience of 85,000 contacts you want those emails to come from a member of your 35 strong sales team. It’s critical to ensure the CRM is the source of truth for the ownership of the various relationships your team has with contacts. A CRM allows you to identify this relationship at the Account, Contact, Lead and Opportunity level. In some organisations, you may have a sales person who “owns” the relationship at the Account level. However larger organisations may then have varying owners of a relationship at the Lead, Opportunity and Contact Levels. When the CRM is setup correctly, these owners will also be “CRM Users”. Eloqua is able to look at the CRM User Profile and merge their details into a specific email based on the relationship of the contact and the CRM User. In addition, CRM User Profile Data can be displayed in a signature with the standard details you would expect in a signature e.g. first name, last name, job title, department, office address, office phone, mobile phone and email etc. What happens when a salesperson leaves your organisation? Good question. The accuracy of the data stored in your CRM rests with your CRM Administrator and probably the Sales Operations team. Most CRM platforms provide for the mass update of data e.g. the replacing one CRM User with another. This is also the case when accounts are reassigned, sales territories change etc. As long as your CRM data is accurate, Eloqua will always send emails from the right CRM user to the right contact or lead. Ensure your CRM is configured correctly and that you’re CRM Administrator hasn’t created an unworkable solution. Clean CRM Data. If the First Name field is in uppercase e.g. JOHN v’s John, you have some work to do. Nothing screams spam more than an email addressed to JOHN. Automation is a dream and when done well, it saves time and delivers a great experience. With all automated decisions in Eloqua, you need to create a default. The default is used when specific data is missing from a contact. Ensure ownership data within the CRM is accurate and you have a business process in place to maintain the accuracy of the data. This will include working with Sales Operations, your CRM Administrator and Human Resources in the context of new and departing employees. Some tips for B2B Marketers this season	When timing is everything, is your marketing truly agile?